VemoHerb® BP is a biologically active plant additive for fodder and drinking water. It contains biologically active blend of proprietary manufactured herbal extracts in a proper combination. It is used as a growth promoter and effective antioxidant for prevention and treatment while breeding animals - broilers, laying hens, pigs, rabbits and calves. The efficiency of using different antibiotics at subtherapeutic doses in compound fodders for non-ruminants is beyond any doubt since 1950, with regard to animal's morbidity rate decreasing, feed conversion ratio improvement and growth rate increasing, which result in higher economic efficiency. The full ban of the European Community on antibiotics as growth promoters in stock-breeding has set out specialists from all over the world in search of an alternative to the subtherapeutic antibiotics doses. This ban was prompted by the risk of creating bacterial resistance to antibiotics, as well as by the care for humans as consumers of animal products and by the risk of residues, which may lead to allergic reactions, immune deficiency, etc. For the last few years the efforts of a numerous research centres and separate scientific teams have been focused on searching for "safe", "natural" and ecological products as an alternative to the so far used antibiotic growth promoters. Different feed additives have been studied, such as probiotics (live microorganisms, regulating the microbiological population in the alimentary tract), pre-biotics (pH regulation acidifiers, creating good conditions for the useful micro flora development), enzymes, oleaginous glycosides and lately different vegetable extracts and essential oils based on chestnuts, marjoram, wild thyme (Thymus serpilorum), nettle, etc. Since remote past it has been widely known that herbs have a specific therapeutic effect, based on their anti-microbial and antioxidant activities, endocrine stimulating and immune stimulating properties. The polyphenols from the catechin group (catechin, etc. ), and flavonoid group - quercetin, apigenin, rutin and others, are natural antioxidants which effectively prevent and retard the oxidation of foodstuffs. The inclusion of VemoHerb® BP plant additive in the rations stimulates animals' appetite, improves the metabolic and immune status, as well as the general health status and productivity. The antioxidant compounds (mainly polyphenols) of the plant extracts are used to protect oxidation sensitive vitamins, lipids and other nutrients during feed storage and feeding in the gastrointestinal tract. The combination of vitamin Е with plant polyphenol compounds (catechin, quercetin, rutin, etc.) affects the transfer of vitamin Е and increases its antioxidant potential. It has astringent and anti-microbial action, improves the transfer of vitamin E and shows palpable hepatoprotective effect. Enhances growth intensity, improves feed conversion ratio, and decreases death rate. VemoHerb® BP is used as a growth promoter and antioxidant when breeding laying hens, broiler chickens, growing poultry and rabbits. It has astringent, anti-microbial and anti-helminthic action and shows palpable hepatoprotective effect – strengthens the liver and prevents it from bacterial infections. The content of antioxidants (plant polyphenols, vitamin E or combinations) stimulates and strengthens the functions of the immune system, improves the body’s resistance to viruses, bacteria and intestinal parasites, thus reducing mortality, especially in young animals. Enhances growth intensity, improves the feed conversion ratio, reduces the postnatal disorders, it has immune stimulating effect and decreases death rate. VemoHerb® BP is used as a growth promoter and antioxidant when breeding growing pigs and lactating sows. It is an alternative to the AGP doses. 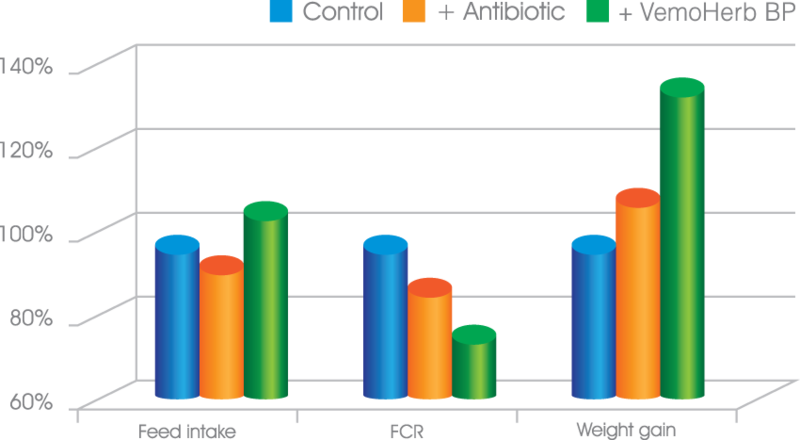 VemoHerb® BP is an alternative to the antibiotic growth promoters, without any risk of resistance of the microorganisms and residues in the meat, milk, eggs and the environment. VemoHerb® BP increases the endurance to micotoxins and improves the function of the liver, the transfer of vitamin Е and enhances its antioxidant potential thus improving the oxidative stability of meat. While using VemoHerb® BP it is not necessary to observe any withdrawal period before slaughtering the animals or obtaining the eggs for people consumption or technological treatment. VemoHerb® BP is compatible and can be applied along with vitamins, macro- and microelements, amino acids, organic acids, different antioxidants, antibiotics and other chemotherapeutic agents. Mixture of biologically active, natural compounds: aromatic ketones /thujone/, aromatic alcohols/thujol/, tannic compounds /tannin/, flavonoids /quercetin, rutin and apigenin/, coumarins /esculin, cichoriin/, polyphenols /catechin/, inulin, maltol and others. Anti-helminthic and antibacterial. Stimulates the endocrine glands and helps the assimilation of fodder. Hepatoprotective. Prevents the liver from impact of toxins and mycotoxins. 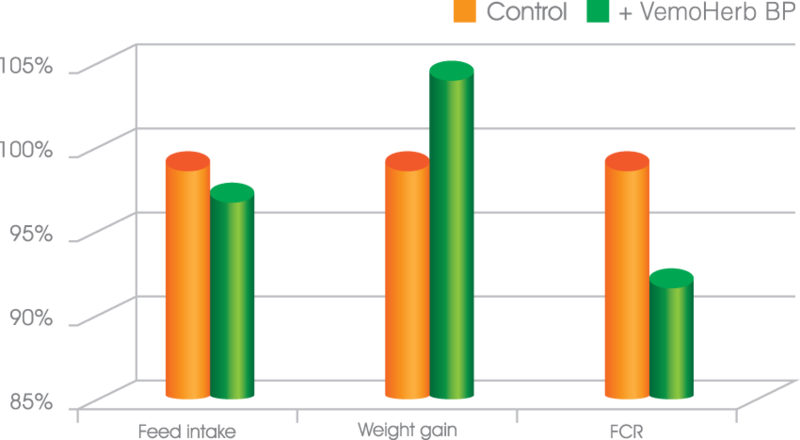 Considerably increases the weight gain and improves the feed conversion ratio as shown on the chart above. The economical analysis of the obtained results shows 0.20 EUR profit per chicken for the test group broilers and we have even better economical effect for the pigs - 0.169 EUR profit per kilogram live weight of the test group compared to the control.